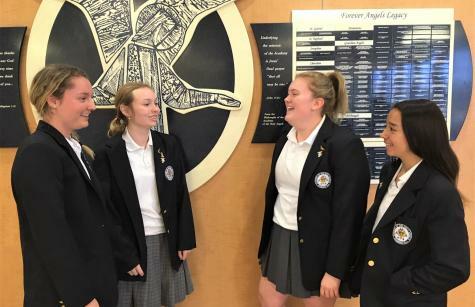 Sophia Melone, Caitlin Brannigan, Sarah McGowan, and Jacklyn Kelly are well known throughout the Academy of the Holy Angels for their exemplary kindness. On April 4th, all four Angels received the Sister Catherine Green Kindness Award in recognition of their ability to light up a room, share compassion, and ensure that everyone is included. Melone, a freshman from Tenafly, was honored for being caring, empathetic, supportive, and inclusive. “She always makes it her mission to put a smile on someone’s face. If someone is being left out, she focuses on making that person a part of the conversation,” one friend said of Melone. Brannigan was recognized for putting others’ needs before her own, and always working to lift people’s spirits. Friends say this sophomore from Hillsdale inspires them to be optimistic. McGowan, a junior from Rutherford, is known for illuminating the room with her positive energy. This member of the junior class has a contagious smile and manages to get along with everyone. Kindness Awards are presented to Holy Angels students whose actions and attitudes inspire others. AHA Dean of Students Andréa Beyer accepts nominations from members of the school community, and the honorees are chosen by the administration.